Double cap rivets: 3 colors (gold, silver, bronze,); each color two sizes,Total 210 Sets. 2 Assorted sizes: large size that the cap, post and base all are 8 mm (5/ 16 inch); Small size that the cap, post and base all are 6 mm (1/ 4 inch). 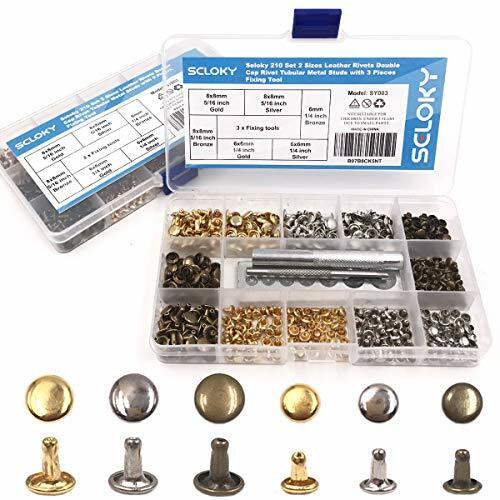 Practical base tool: 2.5mm Punch rushed, Rivet rushed(It can be used to install rivet within 10mm), Multi-function 7 hole bottom sitting(A variety of specifications including 6 mm and 8 mm). If you have any questions about this product by Seloky, contact us by completing and submitting the form below. If you are looking for a specif part number, please include it with your message.